After releasing The Tribez & Castlez on iOS and Android devices in February, social and mobile game company Game Insight has launched the game on Facebook, bringing the medieval city-building experience to a new group of gamers. This spin-off to the original “The Tribez” sees popular characters from the first game traveling to a medieval kingdom with the player, which must be repaired and protected over time. The Tribez & Castlez’ sees players building up a kingdom by assigning their workers to complete tasks, like removing debris from the kingdom’s courtyard or outer grounds, or working on farms to produce crops for the land. Each task takes time to complete, but players can speed up many of these tasks with premium currency. Workers need food to complete tasks, which can be gathered via the aforementioned farms, or by tending fruit trees and other general debris items. As players complete quests, they’ll need to gather more and more resources, and are asked to build huts within the kingdom to increase their worker population. This allows users to complete more individual tasks simultaneously, while generic building upgrades increase the earnings of these structures. Eventually, players will unlock new land expansions, and will access new resources like processed lumbers and textile materials. This comes as players earn experience points and level up, which rewards players with a few premium currency. 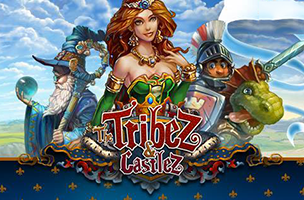 The Tribez & Castlez is now available to play for free on Facebook. Check back soon to follow the game on AppData, our tracking service for mobile and social apps and developers.